Mexico is a country in North America directly south of the United States. It borders the North Pacific Ocean to the west, Guatemala and Belize to the south, and the Caribbean Sea and the Gulf of Mexico to the east. 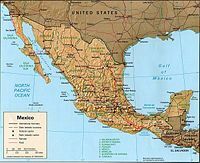 Mexico is a federal republic with 31 states and 1 federal district. Its capital is Mexico City. At present Mexico's territory covers almost 2 million square kilometers with a population of about 113.7 million (2011 est.). Major cities: Mexico City (capital) 19.319 million; Guadalajara 4.338 million; Monterrey 3.838 million; Puebla 2.278 million; Tijuana 1.629 million (2009). Elisa Nájera, Miss Mexico 2007. Mexico is the most populous Spanish-speaking country in the world and the second most-populous country in Latin America after Portuguese-speaking Brazil. About 70% of the people live in urban areas. Many Mexicans emigrate from rural areas that lack job opportunities—such as the underdeveloped southern states and the crowded central plateau—to the industrialized urban centers and the developing areas along the U.S.-Mexico border. The Mexico City region has 18 million people and is the largest concentration of population in the Western Hemisphere. Cities bordering on the United States—such as Tijuana and Ciudad Juarez—and cities in the interior—such as Guadalajara, Monterrey, and Puebla—have undergone sharp rises in population and income in recent years. In 2008, according to the Pew Research Center 12,7 millions of immigrants in the US were of Mexican origin (32% of all immigrants living in that country). Mexicans often join and serve together in the US military. There are high concentrations of Mexicans and Mexican-Americans in California marine units, Texas National Guard units, and, for some unexplained statistical quirk, there are many Mexican Patriot missile operators. Museo Universitario de Arte Contemporaneo. Education is among the Mexican government's highest priorities, and the education budget has continued to grow in recent years. Funding for education increased from 6.9% of GDP in 2002 to 7.3% of GDP in 2005. While efforts to decentralize responsibility for education from the federal to the state level in order to improve accountability are ongoing, the central government still retains significant authority. Although educational performance in Mexico has improved substantially in recent decades, the country still faces several major problems, including providing education to rural and indigenous populations. Education is currently mandatory for ages 5 through 15. An education reform law enacted in 2002 will make preschool mandatory for all children ages 3 and up by 2008. This reform is being implemented in stages. In 2005, 77.4% of the population between the ages of 3 and 15 were enrolled in school. Primary, including preschool, enrollment totaled 18.8 million in 2005. Enrollment at the secondary public school level rose from 5.4 million in 2000 to 5.9 million in 2005. After a significant increase in higher education enrollment during previous decades, Mexico has seen a slower rise in university enrollment more recently. Numbers rose from 2 million enrolled in 2000 to 2.4 million in 2005. Population (2011 estimate): 113.4 million. Annual growth rate (2011 estimate): 1.102%. Ethnic groups: Indian-Spanish (mestizo) 60%, Indian 30%, Caucasian 10%. Language: Spanish only 92.7%, Spanish and indigenous languages 5.7%, indigenous only 0.8%. Education: Years compulsory—11 (note: preschool education was made mandatory in Dec. 2001). Literacy—86.1%. Health (2004 est. ): Infant mortality rate—21.69/1000. Life expectancy—male 72.18 years; female 77.83 years. Work force (2000, 39.81 million): Agriculture, forestry, hunting, fishing—21.0%; services—32.2%; commerce—16.9%; manufacturing—18.7%; construction—5.6%; transportation and communication—4.5%; mining and quarrying—1.0%. Natural resources: petroleum, silver, copper, gold, lead, zinc, natural gas, timber. Highest Point: Volcan Pico de Orizaba 5,700 Mts. Border countries: Belize 250 km, Guatemala 962 km, US 3,141 km. Climate: varies from tropical to desert. Terrain: high, rugged mountains; low coastal plains; high plateaus; desert. Exclusive economic zone: 200 nm. Priscila Perales, Miss Mexico 2005, Miss International 2007. Major Industries: Food and beverages, tobacco, chemicals, iron and steel, petroleum, mining, textiles, clothing, original motor vehicles, consumer durables, tourism. Tequila is originally produced in Mexico. Mexican commodities which have gained worldwide popularity include chocolate, vanilla, tomatoes and the poinsettia plant. Highly developed cultures, including those of the Olmecs, Mayas, Toltecs, and Aztecs, existed long before the Spanish conquest. Hernando Cortes conquered Mexico during the period 1519-21 and founded a Spanish colony that lasted nearly 300 years. Independence from Spain was proclaimed by Father Miguel Hidalgo on September 16, 1810. Father Hidalgo's declaration of national independence, known in Mexico as the "Grito de Dolores", launched a decade long struggle for independence from Spain. Prominent figures in Mexico's war for independence were Father Jose Maria Morelos; Gen. Augustin de Iturbide, who defeated the Spaniards and ruled as Mexican emperor from 1822–23; and Gen. Antonio Lopez de Santa Ana, who went on to dominate Mexican politics from 1833 to 1855. An 1821 treaty recognized Mexican independence from Spain and called for a constitutional monarchy. The planned monarchy failed; a republic was proclaimed in December 1822 and established in 1824. Jose Maria Velasco, El Valle de Mexico desde Santa Isabel, 1892. Throughout the rest of the 19th century, Mexico's government and economy were shaped by contentious debates among liberals and conservatives, republicans and monarchists, federalists and those who favored centralized government. During the two presidential terms of Benito Juarez (1858–71), Mexico experimented with modern democratic and economic reforms. President Juarez’ terms of office, and Mexico's early experience with democracy, were interrupted by the Hapsburg monarchy's rule of Mexico (1864–67), and was followed by the authoritarian government of Gen. Porfirio Díaz, who was president during most of the period between 1877 and 1911. The states of New Mexico, California, Arizona, Nevada, Utah, and parts of Wyoming, and Colorado, were part of Mexico until the Mexican American War. Texas was a part of Mexico for only 15 years, until Texans won their independence in the Texas Revolution in 1836, but Spanish Texas (Tejas) lasted between 1690 and 1821. Therefore, some U.S. citizens in this region speak Spanish as their native language. Mexico's severe social and economic problems erupted in a revolution that lasted from 1910–20 and gave rise to the 1917 constitution. Prominent leaders in this period—some of whom were rivals for power—were Francisco Madero, Venustiano Carranza, Pancho Villa, Alvaro Obregón, Victoriano Huerta, and Emiliano Zapata. The Institutional Revolutionary Party (PRI), formed in 1929 under a different name, emerged from the chaos of revolution as a vehicle for keeping political competition among a coalition of interests in peaceful channels. For 71 years, Mexico's national government was controlled by the PRI, which won every presidential race and most gubernatorial races until the July 2000 presidential election of Vicente Fox Quesada of the National Action Party (PAN). He was succeeded in 2006 by another PAN candidate Felipe Calderón. In January 2009, Mexico assumed a nonpermanent seat on the UN Security Council for the 2009-10 term. Famous Mexicans of history include: Sor Juana Inés de la Cruz, Benito Juarez, Porfirio Diaz, Justo Sierra Mendez, Francisco Madero, Francisco Gabilondo Soler, Jose Maria Velasco, Joaquin Clausell, Lazaro Cardenas, Frida Kahlo, Diego Rivera, Carlos Chavez and Octavio Paz. Famous Mexicans of today: Felipe Calderon, Carlos Slim, Salma Hayek, Priscila Perales, Lorena Ochoa, Ana Gabriela Guevara, Carlos Fuentes, Guillermo del Toro, Alejandro González Iñárritu, Alfonso Cuarón, Mario Molina, Rodolfo Neri Vela, Salvador Palma Vargas, Carlos Franco, Ángel Aliseda, Emanuel Johansen, Adriana Alcántara Ruiz, Dalia Graciela Díaz Gómez, Carlos Hernández Mejía, Belem Guerrero, Raúl Gío Argáez, Fernando Valenzuela, Hugo Sanchez, Cuauhtemoc Blanco, Rafa Marquez, Javier Aguirre, Giovanni dos Santos, Guillermo Pérez Sandoval (gold medal Beijing 08) and María Espinoza (also gold medal Beijing 08). In 2017, it was reported that Mexico had become the second deadliest conflict zone in the world, after Syria (through the Syrian Civil War). According to the 2000 census, approximately 88% of respondents identify themselves as at least nominally Catholic. There are an estimated 11,000 Catholic churches and 14,000 Catholic priests and nuns. An additional estimated 90,000 laypersons worked in the Catholic Church. Groups that constitute less than 5% of the population include evangelicals (Pentecostals, neo-Pentecostals, and Pentecostal Roots), "historical" Protestants (defined by the Government as Presbyterian, Baptist, Methodist, Nazarene, Mennonite, and others), Seventh-day Adventists, Jehovah's Witnesses, Church of Jesus Christ of Latter-day Saints (Mormons), and Jews. The General Director for Religious Associations of the Federal Secretariat of Government (GDAR) registered a total of 3,554 evangelical and 80 traditional Protestant associations. The exact number of evangelical and Protestant churches and pastors is unknown, and statistics on membership remain scant. Official figures sometimes differ from membership claims of religious groups. For example, the Seventh-day Adventist Church claims a nationwide membership of 600,000 to 700,000 persons; however, according to the 2000 census, only 488,945 persons identify themselves as such. Also according to the 2000 census, 205,229 persons identify themselves as Mormons, whereas the Mormons claim membership of approximately 1.2 million. Our Lady of Guadalupe, original image at the Basilica. Non-Catholic Christians are concentrated primarily in the south. In the State of Chiapas, 21.9% of respondents in the 2000 census identify themselves as Protestant; however, some Protestant evangelical groups claim a much higher pecentage. The Jewish community claims approximately 50,000 members, most of whom live in Mexico City; there are also congregations in Guadalajara, Monterrey, Tijuana, and Cancún. There is a small Muslim population in the city of Torreón, Coahuila, and there are an estimated 300 Muslims in the San Cristobal de las Casas area in Chiapas. Some indigenous people in the states of Chiapas, Oaxaca, and Yucatán practice a syncretic religion that mixes Catholic and pre-Hispanic Mayan religious beliefs. In some communities, particularly in the south, there is a correlation between politics and religious affiliation. A small number of local leaders reportedly manipulate religious tensions in their communities for their own political or economic benefit, particularly in Chiapas. The 1917 constitution provides for a federal republic with powers separated into independent executive, legislative, and judicial branches. Historically, the executive has been the dominant branch, with power vested in the president, who promulgates and executes the laws of the Congress. The Congress has played an increasingly important role since 1997, when opposition parties first made major gains. The president also legislates by executive decree in certain economic and financial fields, using powers delegated from the Congress. The president is elected by universal adult suffrage for a 6-year term and may not hold office a second time. There is no vice president; in the event of the removal or death of the president, a provisional president is elected by the Congress. The Congress is composed of a Senate and a Chamber of Deputies. Consecutive re-election is prohibited. Senators are elected to 6-year terms, and deputies serve 3-year terms. The Senate's 128 seats are filled by a mixture of direct-election and proportional representation. In the lower chamber, 300 deputies are directly elected to represent single-member districts, and 200 are selected by a modified form of proportional representation from five electoral regions. The 200 proportional representation seats were created to help smaller parties gain access to the Chamber. The judiciary is divided into federal and state court systems, with federal courts having jurisdiction over most civil cases and those involving major felonies. Under the constitution, trial and sentencing must be completed within 12 months of arrest for crimes that would carry at least a 2-year sentence. In practice, the judicial system often does not meet this requirement. Trial is by judge, not jury, in most criminal cases. Defendants have a right to counsel, and public defenders are available. Other rights include defense against self-incrimination, the right to confront one's accusers, and the right to a public trial. Supreme Court justices are appointed by the president and approved by the Senate. Estela de Luz in Mexico City. Vicente Fox Quesada of the National Action Party (PAN) was elected president in July 2000 in what were widely considered the freest and fairest elections in Mexico's history. Fox began his six-year term on December 1, 2000. His victory ended the Institutional Revolutionary Party's (PRI) 71-year hold on the presidency. President Fox completed his term on December 1, 2006, when Felipe Calderon assumed the presidency. Numerous electoral reforms implemented since 1989 have progressively opened the Mexican political system, and opposition parties have made historic gains in elections at all levels. At the same time, this opening has left Mexico's political institutions divided. Fox is credited with ending one-party rule and consolidating the opening of Mexico's political system. Under Fox, Mexico's highest office became a true constitutional presidency, considerably weakened in comparison to the PRI years by the PAN's lack of control over the Congress. In 2018, Mexico received its first leftist president in 32 years, after being controlled by technocrats during that period. The 2006 elections resulted in an extremely tight race, with a margin of less than one percent separating the vote totals of the two leading candidates for president, Felipe Calderon of the PAN and Andres Manuel Lopez Obrador (AMLO) of the left-of-center Democratic Revolution Party (PRD). The PRI candidate, Roberto Madrazo, came in a distant third. David Alfaro Siqueiros, The People for the University. The University for the People. 1952-56. Lopez Obrador contested the results of the July 2 presidential election, alleging that it was marred by widespread fraud. He challenged in court the result of the Federal Electoral Institute's tabulation showing that Calderon had won the election and launched a mass street protest demanding a nationwide vote-by-vote recount. Mexico's Federal Electoral Tribunal, while acknowledging the presence of randomly-distributed irregularities, rejected Lopez Obrador's accusation of widespread fraud and upheld Calderon's victory on September 5, 2006. On September 16, 2006, the PRD sponsored a "National Democratic Convention," convened on Mexico City's historic central square, that rejected Calderon's presidency, approved a resolution naming Lopez Obrador Mexico's "legitimate" president, and called for the creation of a parallel executive cabinet. Convention participants also approved a long-term civil resistance action plan. Lopez Obrador's support is largely drawn from Mexico's poorer classes, some of whom feel disenfranchised from Mexico's political system. In the 2006 elections, the PAN emerged as the largest party in both the Senate and the Chamber of Deputies, with just over 40 percent of the seats in each house of Congress. It does not enjoy a legislative majority. Although the PRI no longer controls the Presidency and has fewer congressional seats than either the PAN or PRD, it remains a significant force in Mexican politics, holding 17 governorships. One of President Fox's most important reforms was the passage and implementation of Freedom of Information (FOIA) laws that, by the end of 2005, were in effect for the federal government, Mexico City, and 26 states (only two states had such laws in 2001). These laws are a cornerstone in Mexico's fight against corruption, and Mexico's FOIA laws and enforcement mechanisms have been hailed as international models. President Fox also highlighted the need for modernization of Mexico's criminal justice system, including the introduction of oral trials. Although judicial reforms stalled at the federal level during the Fox years, 10 states have now either completed or are in the process of enacting such reforms. Furthermore, all presidential candidates in the 2006 elections committed to further federal judicial reforms. Under President Fox, the executive branch became more accountable, transparent, and citizen-centered. In 2003, Mexico passed its first-ever Civil Service Law, which introduced an on-line application system and competence-based hiring. The Fox administration's good government agenda also included the initiation of government services via Internet, the development of citizen charters that set standards for service delivery, and the reduction in the percentage of public servants working in administrative jobs from one out of two to one out of four. Traditionally, Mexico has sought to maintain its interests abroad and project its influence largely through moral persuasion and has championed the principles of nonintervention and self-determination. In its efforts to revitalize its economy and open up to international competition, Mexico has sought closer relations with the U.S., Western Europe, and the Pacific Basin. President Fox more actively promoted international human rights and democracy and sought to increase Mexico's participation in international affairs. Embassy of Mexico in Berlin. Mexico actively participates in several international organizations; it was elected to a seat on the UN Security Council for the period 2002-03. It is a strong supporter of the United Nations and Organization of American States systems and also pursues its interests through a number of ad hoc international bodies. Mexico has been selective in its membership in other international organizations. It declined, for example, to become a member of Organization of Petroleum Exporting Countries. Nevertheless, Mexico does seek to diversify its diplomatic and economic relations, as demonstrated by its accession to the General Agreement on Tariffs and Trade (GATT) in 1986; its joining the Asia-Pacific Economic Cooperation forum (APEC) in 1993; its becoming, in April 1994, the first Latin American member of the Organization for Economic Cooperation and Development (OECD); and its entering the World Trade Organization as a founding member in 1996. Mexico attended the 1994 Summit of the Americas, held in Miami; managed coordination of the agenda item on education for the 1998 Summit of the Americas in Santiago, Chile; and hosted a Special Summit of the Americas in early 2004. Mexico hosted the September 2003 WTO Ministerial in Cancun and a Hemispheric Security Conference in October of the same year. It was elected to the International Atomic Energy Agency Board of Governors in 2003. In 2002 it hosted the APEC Leaders’ Meeting in Cabo San Lucas. U.S. relations with Mexico are as important and complex as with any country in the world. A stable, democratic, and economically prosperous Mexico is fundamental to U.S. interests. U.S. relations with Mexico have a direct impact on the lives and livelihoods of millions of Americans—whether the issue is trade and economic reform, homeland security, drug control, migration, or the promotion of democracy. The U.S. and Mexico are partners in NAFTA, and enjoy a rapidly developing trade relationship. In March 2005, the U.S., Mexico, and Canada formed the Security and Prosperity Partnership (SPP), which contemplates trilateral and bilateral initiatives to develop new avenues of cooperation that will enhance North America's security, competitiveness, and economic resilience. The scope of U.S.-Mexican relations goes far beyond diplomatic and official contacts; it entails extensive commercial, cultural, and educational ties, as demonstrated by the annual figure of nearly a million legal border crossings a day. In addition, more than a half-million American citizens live in Mexico. More than 2,600 U.S. companies have operations there, and the U.S. accounts for 55% of all foreign direct investment in Mexico. Along the 2,000-mile shared border, state and local governments interact closely. There has been frequent contact at the highest levels. Presidents’ meetings have included the Asia-Pacific Economic Cooperation Leaders’ Meeting in Bangkok in October 2003; President Bush's visits to Monterrey in January 2004 (Summit of the Americas) and March 2002; his April 2001 visit to Guanajuato; President Fox's state visit to the U.S. in September 2001, and his meeting with the President at Crawford, Texas in March 2004. The two Presidents also met in Crawford in March 2005 where, along with then Canadian Prime Minister Martin, they launched the Security and Prosperity Partnership. They held a follow-on SPP meeting with Canadian Prime Minister Harper in Cancun in March 2006. Since 1981, the management of the broad array of U.S.-Mexico issues has been formalized in the U.S.-Mexico Binational Commission, composed of numerous U.S. cabinet members and their Mexican counterparts. The commission holds annual plenary meetings, and many subgroups meet during the course of the year to discuss border security and counter terrorism, trade and investment opportunities, financial cooperation, consular issues and migration, legal affairs and anti-narcotics cooperation, education, energy, border affairs, environment and natural resources, labor, agriculture, health, housing and urban development, transportation, and science and technology. A strong partnership with Mexico is critical to combating terrorism and controlling the flow of illicit drugs into the United States. In recent years, cooperation on counter-narcotics and Mexico's own initiatives in fighting drug trafficking have been unprecedented. The U.S. will continue working with Mexico as it seeks to strengthen its cooperation and anti-drug efforts. The U.S. and Mexico continue to cooperate on narcotics interdiction, demand reduction, and eradication. Cooperation between the United States and Mexico along the 2,000-mile common border includes state and local problem-solving mechanisms; transportation planning; and institutions to address resource, environment, and health issues. In 1993, the Border Liaison Mechanism (BLM) was established. Chaired by U.S. and Mexican consuls, the BLMs operate in "sister city" pairs and have proven to be effective means of dealing with a variety of local issues ranging from accidental violation of sovereignty by law enforcement officials and charges of mistreatment of foreign nationals to coordination of port security and cooperation in public health matters such as tuberculosis. As the number of people and the volume of cargo crossing the U.S.-Mexico border grow, so, too, does the need for coordinated infrastructure development. The multi-agency U.S.-Mexico Bi-national Group on Bridges and Border Crossings meets twice yearly to improve the efficiency of existing crossings and coordinate planning for new ones. The 10 U.S. and Mexican border states have become active participants in these meetings. A 1889 convention establishing the International Boundary Commission, reconstituted by the Water Treaty of 1944 as the International Boundary and Water Commission, United States and Mexico (IBWC). The IBWC has settled many difficult U.S.-Mexico boundary and water problems, including the regularization of the Rio Grande near El Paso through the 1967 Chamizal settlement. The IBWC divides the use of international waters, builds and operates water conservation and flood control projects, and constructs and maintains boundary markers on the land boundary and on international bridges. In recent years, the IBWC has worked to resolve longstanding border sanitation problems, to monitor the quantity and quality of border waters, and to address water delivery and sedimentation problems of the Colorado River. A series of agreements on border health (since 1942), wildlife and migratory birds (since 1936), national parks, forests, marine and atmospheric resources. In July 2000, the U.S. and Mexico signed an agreement to establish a binational Border Health Commission. The Border Health Commission held its inaugural meeting in November 2000 and is made up of the federal secretaries of health, the ten border states' chief health officers, and prominent community health professionals from both countries. A representative from the U.S. Department of Health and Human Services manages the U.S. Section in El Paso, Texas. The 1983 La Paz Agreement to protect and improve the border environment and Border 2012, a 10-year, binational, results-oriented environmental program for the U.S.-Mexico border region. The Border 2012 Program is the latest multi-year, binational planning effort to be implemented under the La Paz Agreement and succeeds Border XXI, a five-year program that ended in 2000. The 1993 North American Agreement on Environmental Cooperation (NAAEC), creating the North American Commission on Environmental Cooperation under NAFTA by the U.S., Mexico, and Canada, to improve enforcement of environmental laws and to address common environmental concerns. A November 1993 agreement between the U.S. and Mexico, also related to NAFTA, establishing the Border Environment Cooperation Commission (BECC), which works with local communities to develop and certify environmental infrastructure projects such as waste-water treatment plants, drinking water systems, and solid waste disposal facilities. The sister organization, the North American Development Bank (NADBank), uses capital and grant funds contributed by partner governments to help finance border environmental infrastructure projects certified by the BECC. Prior to 2005, both institutions had separate Boards of Directors. In an effort to improve efficiency, the separate Boards were merged into a single entity and the combined Board held its first meeting in June 2006. In 2009, Mexico experienced its most violent and dangerous year of the past decade with a homicide count of at least 7,724, a toll largely attributable to the government's offensive against drug traffickers and the turf wars being waged between the rival cartels themselves. In 2008, 8481 people were murdered. Over the past five years, approximately 20,000 people have died at the hands of organized crime, primarily in the states of Chihuahua, Sinaloa, Baja California, Durango, Michoacán and Guerrero. At least 3,250 homicides took place in the state of Chihuahua alone in 2009, the majority of which took place in Ciudad Juárez, on the border with El Paso, Texas. Many innocent bystanders get shot. Mexico's federal government has deployed nearly 50,000 soldiers to support local police in the war against drug trafficking. Tijuana is among the cities hardest hit by violence as Mexico's drug cartels battle for lucrative smuggling routes past the border to supply illegal drug users in the United States. Mexico is highly dependent on exports to the U.S., which account for almost a quarter of the country's GDP. The result is that the Mexican economy is strongly linked to the U.S. business cycle. Real GDP grew by 3.0% in 2005 and was projected to grow by 4.5% for 2006. Mexico's trade regime is among the most open in the world, with free trade agreements with the U.S., Canada, the EU, and many other countries. Since the 1994 devaluation of the peso, successive Mexican governments have improved the country's macroeconomic fundamentals. Inflation and public sector deficits are under control, while the current account balance and public debt profile have improved. As of September 2006, Moody's, Standard & Poor's, and Fitch Ratings had all issued investment-grade ratings for Mexico's Sovereign debt. Nominal GDP: $1.56 trillion (2010 est.) (rank in world: 12). GDP (PPP method, 2005): $1.07 trillion (rank in world: 13). Per capita GDP (PPP method): $13,800 (2010 est.) (rank in world: 85). Annual real GDP growth: 5% (2010 est. ); (2006 est.) 4.5%; (2005) 3.0%; (2004) 4.4%; (2003) 1.4%; (2002) 0.8%; (2001) -0.2%; (2000) 6.6%. Avg. annual real GDP growth (2000-2005): 3.2%. Inflation rate: (2006 est.) 3.4%, (2005) 3.3%; (2004) 5.2%; (2003) 4.0%; (2002) 5.7%; (2001) 4.4%; (2000) 9.0%. Agriculture (4% of GDP): Products—corn, beans, oilseeds, feed grains, fruit, cotton, coffee, sugarcane, winter vegetables. Industry (26% of GDP): Types—manufacturing, energy, construction, chemicals, iron and steel, petroleum, mining, textiles, clothing, motor vehicles, consumer durables, tourism. Services (70% of GDP): Types—commerce and tourism (21%), financial services (13%), and transportation and communications (11%). Trade (Goods): Exports (2005)--$214 billion. Imports (2005)--$222 billion. Exports to U.S. (2005)--$183 billion (86% of total). Imports from U.S. (2005)--$118 billion (53% of total). Major markets—U.S., EU, Canada, Colombia, Japan. World Trade Center, Mexico City. Mexico is among the world's most open economies, but it is dependent on trade with the U.S., which bought 86% of its exports in 2005. Top U.S. exports to Mexico include electronic equipment, motor vehicle parts, and chemicals. Top Mexican exports to the U.S. include petroleum, cars, and electronic equipment. There is considerable intra-company trade. Mexico is an active and constructive member of the World Trade Organization (WTO). It hosted the September 2003 WTO Ministerial Meeting in Cancun. The Mexican Government and many businesses support a Free Trade Area of the Americas. Trade disputes between the U.S. and Mexico are generally settled through direct negotiations between the two countries or via WTO or North American Free Trade Agreement (NAFTA) panels. The most significant areas of friction involve agricultural products such as sugar, high fructose corn syrup, apples, and rice. Starting in 1994, NAFTA greatly boosted Mexico's exports to the U.S. and made the country more attractive for foreign investment. It also helped it to weather the 1994-1995 peso crisis by ensuring access to U.S. and Canadian markets. There has been a growth in the orther states of Mexico of large multinational companies whose maquiladora assembly operations have gained an increasingly larger proportion of Mexico's export production. Meanwhile, the proportion of production by smaller manufacturing firms and other producers has steadily shrunk. Mexico continues to be an importer of technology and innovative processes, and likewise remains heavily dependent on the performance of the U.S. economy. Manufacturing remains concentrated in the Federal District, Jalisco and Nuevo León. Mexico's inadequate road system, particularly in the central and southern states, is a serious impediment to attracting foreign investment in those regions, as well for exploiting the full potential of NAFTA. Mexico's agrarian reform program began in 1917, when the government began distribution of land to farmers. Extended further in the 1930s, delivery of land to peasants continued into the 1960s and 1970s at varying rates. This cooperative agrarian reform, which guaranteed small farmers a means of subsistence livelihood, also caused land fragmentation and lack of capital investment, since commonly held land could not be used as collateral. Additionally, only 12% of Mexico's land area is arable, of which less than 3% is irrigated. This, coupled with a general lack of economic opportunity in rural areas, has made it difficult to raise the productivity and living standards of Mexico's subsistence farmers. Agriculture accounted for 4% of GDP in 2005, yet agricultural employment accounted for over 16% of total employment because wages are low. However, the number of Mexican farmers is steadily decreasing as they seek greater economic opportunities from off-farm employment. Poor availability of credit continues to plague agriculture. Agricultural loans were hard hit by the 1994 peso crisis and many private banks view agricultural lending, particularly to smaller producers, as too risky. Several government entities provide public credit to the rural sector, including Financiera Rural, a development bank dedicated to supporting agriculture. In an effort to raise rural productivity and living standards, Article 27 of the Mexican Constitution was amended in 1992 to allow for the transfer of communal land to the farmers cultivating it. They then could rent or sell the land, opening the way for larger farms and economies of scale. There have been few actual sales of communal land, and most have been limited primarily to suburban areas where land values are high. One inhibiting factor may be community opposition based on vested interests in maintaining the communal land system. Mexico subsidizes agricultural production through various support programs, the most notable being the PROCAMPO initiative. Since the early 1990s, the availability of program payments has shifted from primarily grains and legumes to all commodities, provided a farmer was producing during a certain base period. Total support program funding for 2004 was approximately $2.4 billion, with PROCAMPO payments of $88 per hectare for producers with more than five hectares and $100 per hectare for producers with 1-5 hectares. The manufacturing sector, which accounts for about 18% of GDP, grew by 1.2% in 2005. Construction grew by 4% in real terms in 2005, fueled by a boom in housing finance. According to Mexico's Ministry of Economy, foreign direct investment (FDI) in Mexico for 2005 was $18.8 billion, down slightly from the year before. The U.S. was once again the largest foreign investor in Mexico, accounting for 66% of reported FDI. The most recent numbers released by Mexico show FDI for January through June 2006 at $8.7 billion. In 2005 Mexico was the world's sixth-largest oil producer, its eighth-largest oil exporter, and the third-largest supplier of oil to the U.S. Oil and gas revenues provide more than one-third of all Mexican Government revenues. Mexico's state-owned oil company, Pemex, holds a constitutionally established monopoly for the exploration, production, transportation, and marketing of the nation's oil. While private investment in natural gas transportation, distribution, and storage has been permitted, Pemex remains in sole control of natural gas exploration and production. Despite substantial reserves, Mexico is a net natural gas importer. Mexico's land transportation network is one of the most extensive in Latin America with 117,000 kilometers (km.) of paved roads, including more than 10,000 kilometers of four-lane paved roads. The 26,622 kilometers (16,268 mi.) of government-owned railroads in Mexico have been privatized through the sale of 50-year operating concessions. Mexico's ports have experienced a boom in investment and traffic following a 1993 law that privatized the port system. Mexico's ports moved nearly 1.7 million containers in 2003. A number of international airlines serve Mexico, with direct or connecting flights from most major cities in the United States, Canada, Europe, Japan, and Latin America. Most Mexican regional capitals and resorts have direct air services to Mexico City or the United States. In 2005, the Government of Mexico agreed to sell Mexicana, one of the two main national airlines, to a private investor. Airports are semi-privatized with the government still the majority shareholder, but with each regional airport group maintaining operational autonomy. The telecommunications sector is dominated by Telmex, the former state-owned monopoly. Several international companies compete in the sector with limited success. The teledensity rate in Mexico (around 16%) is among the lowest in Latin America. Cellular penetration is much higher with over 33 million cellular customers in 2004. However, 31 million of these customers use prepaid cards, and many use their phones to receive calls only. Mexico's satellite service sector was opened to competition, including limited foreign direct investment, in 2001. Tourism—mostly from the U.S. and Canada—is the third largest industry, with revenues of $13 billion in 2008. 80 Million Americans visited in 2008, and despite the Recession of 2008 the numbers are up for 2009 because Mexico is a much cheaper destination than Europe. The Ministry of Tourism, through INFOTUR, provides free information to Mexican and foreign tourists, including co-nationals, about tourist destinations, attractions and services. Mexican Independence Day, September 16: the day that Miguel Hidalgo delivered El Grito de Dolores, and announced the Mexican revolt against Spanish rule. Cinco de Mayo: May 5: honoring the Mexican victory over the French army at Puebla in 1862. This holiday is also celebrated unofficially in parts of the U.S.
Paola Espinosa, together with Tatiana Ortiz, won bronze medals in Beijing 2008. Mexico religion From Library of Congress, Country Studies. Mexico One World - Nations Online. ↑ Mexico Fiercely Opposes the Iraq War, But Mexicans Are Dying There Every Week. ↑ Mexico now considered second deadliest conflict zone after Syria, study says. Fox News. Retrieved May 9, 2017. ↑ See U.S. State Department "International Religious Freedom Report 2008"
↑ Mexico gets first leftist leader after 32 years of technocrats. Fox News. December 1, 2018. Retrieved December 1, 2018. ↑ Mexico's violent year of drugs. ↑ Edward J. Chambers, and Peter H. Smith, eds. NAFTA in the New Millennium. (2002) 520 pp. scholarly studies on trade, labor, migration, transport, and the environment. This page was last modified on 9 April 2019, at 12:30. This page has been accessed 126,531 times.